And as a Christian, I feel the question is fraught with even more worry and questions. There’s all this talk about purity and sisters and guarding your heart and not enough about what it looks like practically. Is it even okay to have guy friendships? Is it even possible? These questions were on my mind a lot last year, when I went to college and made a lot of guy friends for the first time. What does it look like to have a God-honoring friendship with a guy? Everything I read seemed to be in the context of dating or marriage. What about just friends? I’m going to share some things that I’ve learned, but please know that this just a start – I’m still learning! Please don’t take these suggestions and boundaries as legalistic; they are simply ways that I have found to be helpful in navigating these friendships. That being said, I do think they are based on some wise principles. Let me start by saying that friendships with guys are great, fun, and very possible. But they should not look the same as our female friendships. Why? Frankly, if the relationship is as close and intimate as it is with your girl friends – hanging out one-on-one a lot, sharing everything in your life, that sort of thing – it suggests that you are really dating. And this dating-without-dating can be a pretty sticky place to be. We’ll discuss dating relationships in another article, but for now, if you are close enough to be that kind of “close best friends” with a guy, it’s probably going to end in heartache for one of you, because at least one of you is hanging on and hoping for more. I’ve seen it happen. This is one of those instances where “guard your heart” really does mean be careful with it – and be careful with his, too. You can be friends without that level of emotional intimacy. -Respect him. I’ve heard this principle a lot, usually as it applies to marriage. Women want to be loved more than anything else in the world. Men want to be respected. Yes, they actually pick respect over love. It’s simply the way God has made them. But this shouldn’t be just put into practice within an official “relationship” – we should respect our fathers, our brothers, our brothers in Christ. And one of the best ways to do this is with our words. Guys can be absolutely leveled by the things we say, even in fun. So why hurt them unnecessarily? Don’t belittle or tear them down with your words, even if you are teasing. We can say things like “You’re such a horrible person!” in the context of a joke and everyone might be laughing…but that could really, really hurt your friend, whether or not he shows it. And the concept of “disrespect” includes means making him feel inadequate, or constantly questioning his judgment. Some of this is obviously more relevant to romantic relationships, because you are closer and a much more important part of his life. But just know how much respect means to him, and be careful with your words. Don’t be too physical. And by “physical” I mean platonic interactions like hugs or arm slugs or things of that nature. My dad has always cautioned me about this, telling me that even if I don’t mean anything by it, it sends mixed messages. This is something that I have to be consciously aware of, because I’m a pretty physical person by nature, and I’m always giving my girl friends hugs or massages. And I’m know that in some parts of the country hugs are as casual as handshakes, so I’m certainly not saying they’re not allowed or anything. Again, this is not legalism! Just – be aware. Don’t hang out one-on-one a lot. This tends to lead to intimate conversations and a building of the really close relationship that may end up hurting one of you in the end. Which I really don’t think is a wise idea. Not that there isn’t potential for hurt in all friendships (every single one involves two sinners, after all! ), but this is a pretty easy way to avoid it and guard your heart. Be careful how much you share – and what. Even in a group context you can share a bit too much, something really deep or personal in hopes of attracting a guy’s attention. I know; I’ve done it. And the same goes for long-distance friendships. They can happen, too; I have a good friend across the country. We write letters or post on the other’s facebook wall occasionally. But the danger here is the same as being one-on-one too much; girls are simply more verbal and we tend to share all our deepest thoughts and feelings pretty easily. And letters, emails, and other things are a really easy way to do this, so just be careful and wise in the things you talk about. I’ve seen several girls get hurt from this sort of thing! Trust that if you are seeking to honor God and obey Him, things will work out. And by this I mean “Don’t be so worried about what you should and should not do that you can’t enjoy a great friendship”. Tell God that you don’t really know what to do, but you want to honor Him. And He’ll lead you, I promise. These are some of my thoughts. 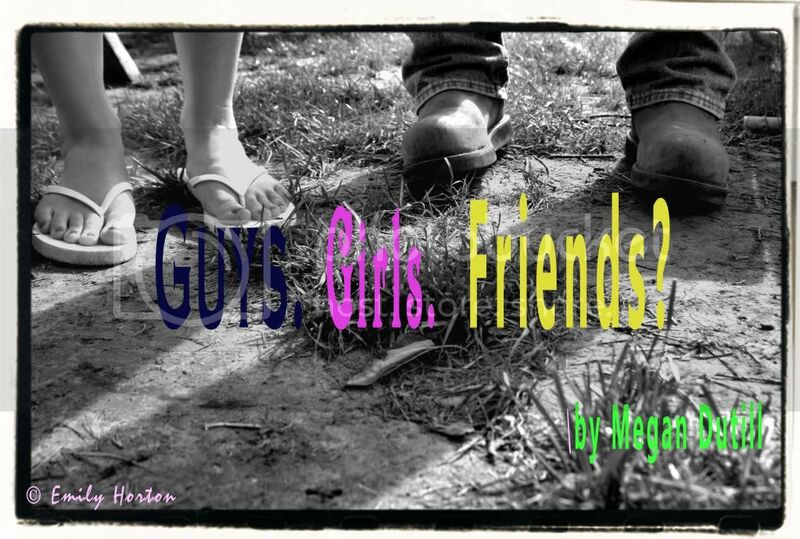 If you want to read more, check out Just Friends by Boundless and Q & A – Guy Friends from GirlTalk. Leslie Ludy’s short book Answering the Guy Questions is a great resource as well. Agree. I am a guy. Is this a girls-only club? Don't wanna be a party pooper. I feel like I've gotten a bit of a crash course in this over the past year, and I agree with everything you've said. Matters of the heart seem to build trust in God in ways nothing else can. I've found that I can't really control my feelings at all, and relying on God is the only thing I can do when I'm struggling with something like this. He is good and faithful to provide in HIS timing, not ours! One thing I would add is that I've found it EXTREMELY dangerous to email or write unless you have a firm hold on what you feel, because it's a great way to "read" into things that aren't there. I think in this we need to be especially careful. Thank you for posting on this! I have to agree with you. Great post! Anyway, I have to say, that I do like Leslie Ludy's book on the subject! Very helpful! I too have shared too much in writing and regretted it. Everyone who is reading this: be careful! I agree! I learned this the hard way. I have some male friends that have been greatly influential to my spiritual life- but all without prying too deep into the sacred areas of my heart. For my personal standards I've decided, a guy friend shouldn't go into the 'best friend category'- and no matter what age! I once had a guy friend that I didn't suppose could possibly be interested in me. He was many years older, and I looked at him as an older brother. I would e-mail a young man only when he was the one that requested, and even then I keep it formal and casual. But with this guy I opened up in a way that I usually saved for girl friends. And... well... one day out out of the blue he seized me and tried to kiss me. As I writhed away, distraught, and he only managed to catch my cheek- I wondered what on earth I'd done. This was all before coming to a set apart life. And I second- Answering the Guy Questions is a really great resource grounded in spiritual truth! Wow, thanks for writing this post! I read once on another girl post how to treat guys as brothers in Christ. I never really talked to a lot of guys, so one day I met a really godly man and forgetting what I read about not being intimate with them, I said something to him that I really shouldn't have. Thankfully he just ignored the comment and was very kind to me and dropped it. I have learned my lesson! Thank you so much for this post. It's very encouraging. So glad it is encouraging to you! May God use it to work in your heart and life, pointing to Jesus!